Hollywood hit Turtle Bay Resort Tuesday when the cast members of "Lost" walked the red carpet for the release of the show's second-season DVD, which drops Sept. 5. Evangeline Lilly said fans are evenly divided about which man her character, Kate, should be with -- Jack (Matthew Fox) or Sawyer (Josh Holloway). TUESDAY NIGHT'S red-carpet "Lost" affair included many of the usual suspects -- except for one. Michael Emerson, who plays the enigmatic Henry Gale on the ABC show, was a surprise addition to the fanfare, clearly ramping up for a more prominent role in Season 3. "I think you're going to warm up to Henry this year," said Emerson, looking dapper and decidedly civilized in a gray suit -- quite the contrast to his battered self on the DVD footage playing in Ola Restaurant on the grounds of Turtle Bay Resort. Jorge Garcia says he's enjoying the longest acting gig he's ever had -- playing kind-hearted Hurley. "They had a human dark force in the show, and they had a note of mystery," Emerson said when asked why the writers decided to incorporate his character more extensively. "They had a puzzle to solve. I think people like these things. I know I do." Did he understand that the audience finds Henry creepy? Emerson laughed and said, "I don't know what the scary element is. I don't know if it's in the playing of it or the perceiving of it. But I like it ambiguous; it's not so exciting to be obvious." CAMERAS ROLLED, shutters clicked and lights flooded the red carpet as a pack of journalists extended microphones and tape recorders while teasing hints about the upcoming season from stars who looked even more glamorous in person than they do on television. The launch of "Lost: The Complete Second Season -- The Extended Experience" on DVD was cause for celebration but not reason enough to attract the entire cast. 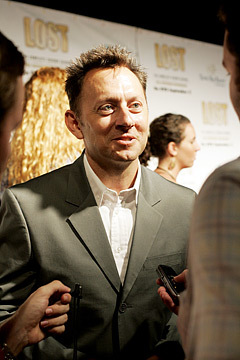 Michael Emerson, who plays Henry Gale, cleaned up nicely for his first walk down a "Lost" red carpet. Actors were escorted from limousines to the red carpet, often sheltered by umbrellas as intermittent showers tempered the gathering. Participants included Evangeline Lilly (Kate), Jorge Garcia (Hurley), Josh Holloway (Sawyer), Terry O'Quinn (Locke), Daniel Dae Kim (Jin), Yunjin Kim (Sun) and a couple of writers and producers. They talked with television, print and online reporters from around the world before heading to the open-air, beachfront restaurant for fresh mahimahi, chicken saté, Hamakua mushroom risotto, music and dancing in the sand. Writer and executive producer Carlton Cuse said the third season would definitely go in a different direction. Season 1 was about discovering the island. Season 2 focused on the "tailies" and the hatch -- "metaphorically going deeper inside the island," with a lot of mythology -- and Season 3 will be "more fun, lighter," emphasizing the Others. Six new episodes will air in a row. The show will then take a break and resume for 17 new episodes in February. 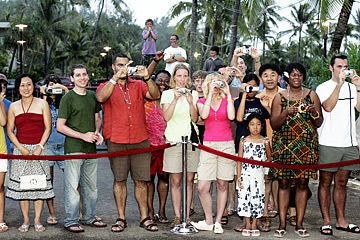 Fans gathered behind the velvet rope for a peek at the stars at Turtle Bay Resort. "I think the theme is kind of us versus them," added Cuse. "But maybe that's not the complete answer. And that's what we're going to explore this season. What you're thinking now about the Others is not the complete story." After a couple of months on the island, romance is in the air. What will happen between Emily and Charlie? Will Kate choose Jack or Sawyer? Who is the father of Sun's baby? Action-adventure fans won't be disappointed, but emotional entanglements will drive many of the plots. There also will be "plenty of weird stuff for everyone who loves that," promised Cuse. Though the actors claimed to be ignorant of upcoming developments, they tried valiantly to provide insights into their characters. Terry O'Quinn smiles for the cameras, a rare occurance for his "Lost" character, John Locke. "I'm sure (Sun) did something wrong," said Yunjin Kim. "Hopefully we'll see more of her dark side, because she's so nice!" Ample conflict is normally a good sign on this show, noted Kim. Resolution usually means your character will be escorted off the show in a body bag. O'Quinn, wearing a black T-shirt, jeans, flip-flops and a day-old beard, said that Locke thought "getting into the hatch was going to give him some definition. Season 2, he went down this hole and started pushing this button, and the magic seemed to go away." He expects this year to be much different. With dimples sparkling, Holloway said Sawyer is sure to "be dragged through the mud and beaten down by all the girls on the show." Lilly thought it likely Kate would find herself in trouble this year -- at times. "With every person we know, there is the possibility of being a villain and the possibility of being a hero. I love that about 'Lost.' "